After touring the country and making her Broadway debut as Princess Jasmine in Disney's Aladdin, Isabelle McCalla gives a breakout performance co-starring as Alyssa Greene (a closeted high school student who must navigate a bigoted mother who expects perfection and a girlfriend who needs her) in Broadway's new hit musical The Prom. 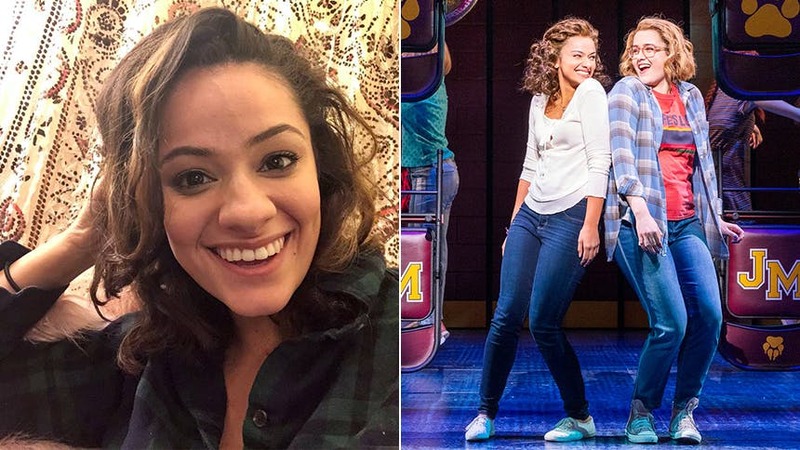 BroadwayBox caught up with Isabelle to discuss her character, her most memorable Aladdin mishap, the book that changed her life, and her West Side Story dream. 1. If you could tell Alyssa one thing, what would you want to say to her? I would want to tell her to listen to her heart and stop trying to please everyone else. It’s better to sacrifice your relationships with people who aren’t looking out for you than it is to sacrifice yourself. 2. Your song “Alyssa Greene” paints such a vivid picture of your character’s life at that point in high school. Where do you think Alyssa ends up in five years? I like to think that Alyssa would have graduated top of her class from an Ivy League University, with a degree in Psychology. I think after the ordeal she went through coming out to her mother, she would want to be able to go down a path that would lead to her being able to help teenagers struggling with the same things that she did, but in a private way. And I think she and her mother are on speaking terms, and while there is love, there is still tension between them when it comes to Alyssa’s partners. 3. This cast has such larger than life personalities. How would you describe life backstage at The Prom? It is unbelievably joyous. These people are so funny and genuinely good human beings, and I feel like I’m always laughing. I love coming to work every day because of them. 4. What was the most memorable part of your prom? Oddly enough, the penne a la vodka. I remember it being so good! 5. What role do you think you slayed during high school? I’m not sure I sIayed any role in high school, but I played Amalia Balash in She Loves Me my sophomore year, and that was probably my best! 6. When you were in high school, what was the dream role you wanted to play on Broadway some day? Anita in West Side Story. 7. What was your greatest mishap touring the country as Jasmine? I fully fell off the Aladdin’s rooftop unit and flat on my face right before “A Million Miles Away.” I crawled back up the stairs and when Adam Jacobs asked if I was ok, I said “You got some slippery stairs there!” The entire audience cackled! 8. What was the most sentimental thing you bought yourself on tour? I bought a lot of books on tour, but my favorite was Gloria Steinem’s My Life on the Road. It kind of changed my life. I wrote the quote “The circle, not the hierarchy is the goal” on my dressing room mirror. I go back to that book often. 9. Tell us a memorable audition story. When I auditioned for Bat Boy my sophomore year of college, I was called back for the female soloist. There were twelve of us in the room, and they had us go down the line one by one and riff over the melody of the opening number. When it was my turn to go, I started out alright, and then on the lyric “Somebody Save Me,” I sang the most horrendous unidentifiable sequence of notes. There was nothing musical about it. I locked eyes with the music director, and she immediately looked down at her pad and tried not to laugh. Needless to say, I didn’t get the part. But it still makes me laugh thinking about it! 10. What was the most memorable part of your first opening night on Broadway? The curtain call was pretty spectacular. The audience was jumping up and down and I remember looking around at my cast, some of whom I’ve idolized for so long, and it kind of hit me that a major dream was coming true. It was a perfect moment in time! Don't miss Isabelle McCalla as Alyssa Greene in 'The Prom' at Broadway's Longacre Theatre.